You are an exotic flower! Collect a fascinating species of style with this intoxicating blouse by Just Cavalli™! Ruched Peter Pan collar. 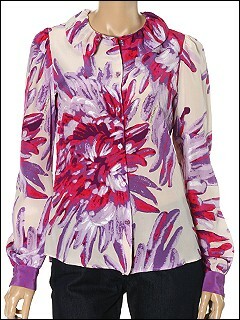 ; Passionate prints of chrysanthemums grace this blouse. ; Button front. ; Long puff sleeves with polka dotted cuffs. ; Single center back pleat. ; Classic cut bottom hem. ; 100% silk. ; Dry clean only. ; Made in Italy. Free shipping in the USA.